Computer Aided Design of Control Systems focuses on the use of computers to analyze and design the control of various processes, as well as the development of program packages with different algorithms for digital computers. The selection first takes a look at the computer aided design of minimal order controllers, including design of interacting and noninteracting dynamic controllers of minimal order and basic algorithm. The book then discusses an accelerated Newton process to solve Riccati equation through matrix sign function; suboptimal direct digital control of a trickle-bed absorption column; and structural design of large systems employing a geometric approach. The text underscores the computer as an aid for the implementation of advanced control algorithms on physical processes and analysis of direct control algorithms and their parallel realization. Topics include hardware influences on the control, process influence, and interactive structure design of direct control systems. 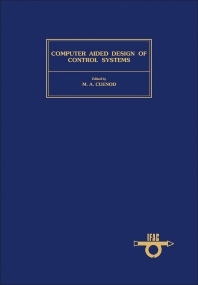 The book also takes a look at the optimal control of randomly sampled linear stochastic systems; computer aided design of suboptimal test signals for system identification; and computer aided design of multi-level systems with prescribed structure and control constraints. The selection is a dependable source of data for readers interested in the uses of computers.